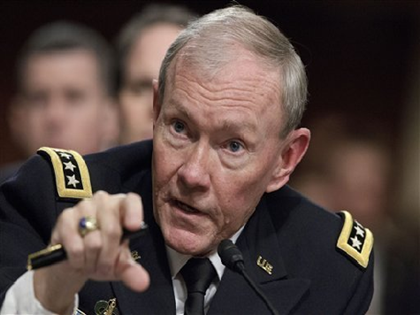 U.S. Army General Martin Dempsey chairman of the Joint Chiefs of Staff, has decided to weigh in on the violence that has erupted in the Middle East. He has asked Florida pastor Terry Jones to back off supporting the movie that portrays the Prophet Mohammed in a negative way. This was a brief call in which Gen. Dempsey expressed his concerns over the nature of the film, the tensions it could inflame and the violence it could cause, and he asked Mr. Jones to consider withdrawing his support for the film. Jones didn’t promise anything. And he’s got every right to express his opinion. Free speech may be a foreign concept to General Dempsey, but it’s still highly valued in America. Dempsey, who publicly abandoned Israel earlier this summer, is apparently not a hard-liner confronting Islamic fundamentalism. But then, seeing as he was appointed by Barack Obama, is there anyone surprised?